These fruit-packed cakes should be served with a wedge of good Lancashire cheese. 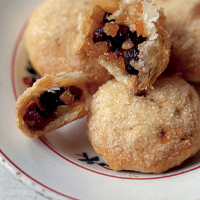 I like to use a good balance of currants and candied peel with not too much sugar for the filling – but I do sprinkle the puff pastry with sugar before baking to create a crunchy coating. Preheat the oven to 200°C/gas 6 and line a baking sheet with non-stick parchment paper. Melt the butter and allow to cool slightly. Mix this with the remaining filling ingredients. Roll the pastry into a rectangle about 40cm x 24cm and 1/2cm thick; cut into 15 x 8cm squares. Place a teaspoonful of filling on each and fold over the corners to seal into a parcel; brush with water to help the edges stick. Turn over and roll gently to flatten. Brush each parcel with milk and sprinkle with a little sugar. Place on the prepared baking sheet and bake for about 15 minutes or until crisp and golden. Leave to cool on a wire rack. A brisk, refreshing cuppa is ideal – but try leaves rather than the ubiquitous bags and notice the difference.